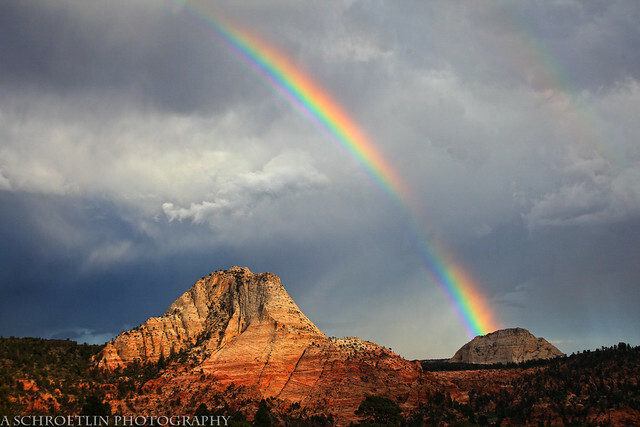 I can never get sick of looking at photos and videos of Zion National Park all day. I swear this place never ceases to amaze me. Every angle is something new and exciting and I love exploring it and seeing what everyone else has captured from there. Everyone see’s something different which makes my job all the more interesting and fun! I get to see what all of YOU love about Zion through your eyes. This is why photography is absolutely amazing and I respect anyone that can carry a super expensive camera into a canyon and capture moments like this one. And while there might not be a pot of gold at the end of this rainbow, there are some golden memories that can be made here at Zion. How can you not love it here? Such a stunning place to visit!